The police force present at the secretariat complex and Bharat Nagar Chowk had to face some tough moments before the protesting health workers were taken into custody and loaded into police vehicles. They were let off at some distance away from the site of the protest. The president of the union, Kiran Bala, said the health workers were staging a protest in support of their demands for the regularisation of their services and fresh recruitment on merit basis to fill vacant posts. She also alleged that during a meeting with them, Punjab Health and Family Welfare Minister Sat Pal Gosain had threatened and ill-treated them. While police officials present at the spot claimed that the protesting health workers were adamant on marching towards Bharat Nagar Chowk and their leaders ignored all pleas to disperse peacefully, the protesters alleged that they were about to leave the venue for the protest when some policemen used foul language against them, which frayed tempers. The stand-off between the health workers and the police, who was present in strength, continued for some time, but the firm stand taken by the police against all attempts to disrupt traffic and create a traffic jam yielded positive results as the health workers boarded the police vehicles and were taken away. 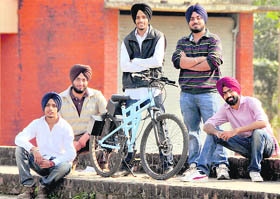 The final year engineering students have named it “H2S3”after the first letter of their names -- Harpreet Singh Ahluwalia, Harvir Singh Ahluwalia, Supreet Singh, Sukhmeet Singh and Simarjot Singh. They have developed an electric bicycle that can be used as a motor vehicle and pedalled like a normal bicycle. “We came up with this idea and wanted to work on a concept that would be eco-friendly and also be viable for a wider application in India,” says Supreet. “With the mounting petrol prices, we felt that the idea made sense and had a lot of scope. Although electric bicycles are available, these are either heavy or lack good design. Some of them are not even regular size. We have brought together the best of the features in a single design and yet it is a practical design,” he says. They have been friends since childhood, choosing the same course, same stream and now working on the same project. They all are residents of Model Town and the project was completed within a few months, including the conception and planning. Sukhmeet comes from a family that is into the manufacture of cycle parts. He wants to contribute to the family business through his engineering skills. Simarjot’s family is into the trading of cycle parts while Supreet wants to use production engineering skills to manufacture toys as his family is into the business. The Ahluwalia twins want to make it big with engineering. “One of the challenges was to design it in such a way that it folds with ease and the wheels are parallel when folded for easy portability,” says Harvir. “With parking being a problem, folding is a very good feature. It can go into a car trunk,” says Dr Rupinder Singh, a faculty member who guided them. The bike is regular size and anyone can ride it. It is equipped with dry lead acid batteries and can ride for 40 km on a single charge. It touches the speed of 30 km per hour without the need to pedal. A person weighing up to 120 kg can ride the bicycle. It is equipped with 15 gears for easy pedalling. It can be folded into half and weighs 32 kg. If a dynamo is fitted, the bicycle can cover up to 100 km on a single charge. If the metal of the frame is replaced with aluminium instead of mild steel, it would make it lighter. Replacing lead-acid batteries with lithium batteries can further lighten the weight. “We will keep working to improving the bicycle further,” the students said. The incident took place around 6 pm when the victim identified as Lakhwinder Singh, alias Jassi, was standing near a gurdwara at Pritam Nagar. Suddenly, a motorcyclist stopped in front of Jassi and opened fire. Jassi said the assailant fired four rounds at him. Three shots missed the target while the fourth bullet hit his ear. The police reached the spot, but the accused had already fled the scene. The investigating officer said personal enmity was the reason behind the attack. This is the second incident of shooting in the last two days. Yesterday, a youth identified as Karan Takhur was thrashed by residents of Chandigarh Road for opening fire in front of the house of Jail Minister Hira Singh Gabria. The sprucing of the stadium has brought cheer to athletes who had been complaining of the poor upkeep of the stadium. The stadium, which had been lying in utter neglect for over a decade, had a leaking roof, broken chairs and windowpanes and running water in the absence of taps until a few days ago. “Thanks to the kabaddi final to be played in the stadium on November 20, the stadium has been given a new look. The whitewash and new flooring, lights and chairs have given the stadium a facelift,” said Harjinder Singh, an athlete. Gurpreet Singh, an international athlete, also said the mega event was a blessing for the infrastructure at the stadium. “I believe that hosting of mega sports events, whether it is kabaddi, athletics, hockey or football, would help in improving the infrastructure,” he said. City residents are using political connection to get VIP passes for the Kabaddi World Cup final. Bureaucrats are receiving calls from politicians and friends for arranging the passes. With Bollywood stars like Akshay Kumar, Chitrangada Singh and Deepika Padukone having confirmed their presence and John Abraham expecting to be a part of the finals, residents are “speculating” the placement of seats in order to share some space with them. The Municipal Corporation is in cleanliness mode in areas around the stadium as well as around hotels where the teams are staying. The civic body is also carrying out fogging operations twice a day in these areas. It is learnt that senior MC officials had conveyed to their subordinates that due to this big event, a large number of VVIPs are expected to attend the final. Due to the fear of dengue fever, MC officials have been asked to conduct regular fogging inside as well as outside the stadium. Three fogging machines have been deployed for the purpose. Talking about the basic infrastructure, swimmers complained that they were unable to practise in winter because the city had no indoor swimming pool. Shooters are also facing problems in the absence of a shooting range in the city. They have to go Sangrur or Patiala to practise. The plight of cricket players is no better. They said despite several promises, the state government could not construct a cricket stadium in the city. Not only the infrastructure, but also the prize money is an issue with players of other sports. While kabaddi players enjoy foreign trips and get enviable cash prize, besides getting gifts in rural fests, the other players in contrast are yearning for a good, balanced diet. Kabaddi has been “glamourised” in Punjab by way of live telecast of matches. Now, every youngster wants to be a kabaddi player. “Sports is not a priority with our politicians. They are organising kabaddi matches only for political gain. But it will cause major damage. The rural youth is the backbone of all sports and they are now getting drawn to kabaddi,” said Teja Singh Dhaliwal, general secretary of the Punjab Basketball Association. “Even players of badminton, tennis, volleyball and basketball, besides athletics are feeling left out. We are disturbed. The government is spending crores of rupees on kabaddi players while players of other sports are yearning for merely a few thousands,” he added. This incident has come as a shock for sportspersons, who lambasted the event management company for hurting the sentiments of the players for whom the stadium is like a temple. “It is a matter of shame. While kabaddi is being projected as a sport to keep the youth away from drugs, the event management company employees were seen making smoke rings inside the stadium. It sends a wrong message. If they felt an urge to smoke, they should have gone outside for a cigarette. The stadium is not the place to smoke cigarettes,” Inderjeet, an athlete, said. The matter came to notice when a group of event management company organisers huddled close to the district sports office and started smoking. Though the police officials present there saw the employees smoke, they did not take any action. This is not the first time that such a thing has happened at the stadium. It was tuned into an open liquor vend during a concert of Gurdas Mann in 2009. It had evoked sharp criticism from the sports fraternity. Gurpal Singh had purchased 80 kgs of sweets from the said sweet shop owner on November 10 to distribute it among their relatives on the occasion of the marriage of his son. Gurpal Singh said he came to know about the fungus-infested sweets when he started receiving calls from his relatives and friends who all complained to him that the sweets distributed by him were infested with fungus. When he opened some other sweet boxes laying at his house, he found that the sweets was really infested with fungus and were stinking. He further said that due to the fungus -infested sweets distributed among his relatives, he and his family had to face embarrassment before their relatives and friends. Following this, Gurpal Singh reached the office of the Jagraon SDM along with a box of sweet purchased by him and informed her about the incident. After examining the sweets, even the SDM said that the sweets were infested with fungus and it might pose serious threat to the persons who would have consumed the sweets. The sweets shop owner, from whom the sweet was purchased, claimed that the sweets were purchased from his shop on November 10. He also claimed that he had told the buyer that the sweet would get infested if not used within one week. But the family kept the sweet for more than one week and it was due to this the sweets became infested with fungus. When contacted, Isha Kalia said that the sweets wasinfested with fungus and was not in a position to be consumed. She further said that she has asked the sweets shop owner to come to her office tomorrow and present his side of the story before her. But she asserted that strict action would be taken if anything wrong is found on the part of sweets shop owner. Local Akali leaders, including zila parishad chairman Manpreet Singh Ayali, former MP Sharanjit Singh Dhillon, cabinet minister Hira Singh Gabria, Youth Akali Dal district president Simarjit Singh Bains, former chief parliamentary secretary Harish Rai Dhanda, Dakha MLA Darshan Singh Shivalik, former MLA Inder Iqbal Singh Atwal, former MLA Ranjit Singh Talwandi, Punjab Traders Board vice-chairman Madan Lal Bagga, besides others had a meeting with Sukhbir Singh Badal last evening. Manpreet Singh Ayali is all set to contest from the Dakha constituency, Sharanjit Singh Dhillon from Sahnewal, Darshan Singh Shivalik from Gill, Hira Singh Gabria might contest from Atam Nagar, Inder Iqbal Singh Atwal from Payal and Simarjit Singh Bains from either Atam Nagar or Ludhiana (South). One of the leaders, who was part of this group that visited Badal village said that keeping in view of the state assembly elections, Akali leaders from across the state were called for a meeting at Badal village last evening. “Sukhbir Singh Badal wanted to discuss the strategies for the upcoming state assembly elections and that is why, we were called there. It was basically an informal meeting and things such as distribution of tickets, important issues to be kept in mind, infighting amongst leaders, besides others were discussed,” said the leader. Speaking at the occasion, the minister claimed that the state government was making special efforts to provide comprehensive healthcare facilities to pregnant women and new born babies. Facility of free institutional delivery is being provided in all government hospitals in addition to other healthcare services. The health services, he said, were being expanded and for this purpose. 686 new doctors, 37 drug inspectors and 3,700 members of para-medical staff had already been appointed. Further, the cabinet had accorded its approval for filling up the remaining 3,669 vacant posts, which include new appointment of specialist doctors, medical officers and supporting staff. An amount of Rs 350 crore has been earmarked by the government for the upgrading of health institutions, he added. Jasjit Singh Biara, chairman, Punjab Health Systems Corporation Limited, Dr JP Singh, director, health and family welfare department, Punjab, Dr Rajesh Sharma and civil surgeon Dr Subhash Batta, among others were present. Ahead of the state assembly elections and the model code of conduct all set to come into force in the state by November end, the Ludhiana Municipal Corporation has fixed November 25 for holding the general house meeting of the civic body.Even the finance and contracts committee (F&CC) meeting of the civic body will be held on November 23. During both the meetings, the MC will try to clear maximum number of files related to development works, so that the development work is not hampered when the model code of conduct is on. The last general house meeting was held on June 17, while the F&CC meeting was held around three months back. Sources within the MC said that the dates were finalised today and senior MC officials asked the councillors to get their files of prepared, so that they could be passed by the F&CC as well as in the general house. “Everyone knows that the model code of conduct will come into force by the end of this month or early next month. So that way, few days are left for the development works to be cleared,” claimed a senior official. Though Chief Minister Parkash Singh Badal has distributed bicycles pasted with his photographs among girl students under the Mai Bhaggo Scheme, but he has failed to find a place in their heart. The girls are reluctant to ride the bicycles with his pictures and a large number of them removed his photograph’s from the basket of their bicycles two days after these cycles were distributed. 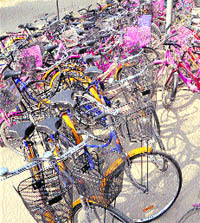 Various MLAs from the ruling party had distributed the bicycles in city schools. While underprivileged girl students are happy getting the bicycles, those owning a vehicle or an easy mode of transport feel embarrassed riding these bicycles. Many of them have a problem with Badal's picture. Some of them have pasted photographs of idols and film stars instead. “My friends would laugh when they saw Badal’s picture, so I removed it. Now, this cycle is mine. Earlier, they would say it was Badal’s cycle,” revealed another girl. Recalling the moments spent with him before the accident assistant sub inspector (ASI) Bhupinder Kaur accompanying the the kabaddi players of Uzbekistan.said, "While driving the police gypsy at a breakneck speed, Harjeet Singh kept saying "dinner as marriage party." Harjeet has specially dressed up for the occasion." Little did Harjeet know that this was his last drive ever. The ASI said that Harjeet was driving the pilot gypsy at a high speed and they entered Bathinda within two hours from a hotel at Pakhowal road in Ludhiana. At a normal speed it takes more than two and half hours to reach Bathinda from Ludhiana. The deceased is survived by his wife Mandeep Kaur, Son Simranjit Singh a student of class VI and daughter Manpreet Kaur. A police party of the Punjab Police presented him a guard of honour at the time of cremation and shots were fired in the air. The villagers were present in large number to pay tributes. A police team led by Ludhiana DSP Amrik Singh was also present apart from some other police officials of Ludhiana district. Ironically, no senior Akali Dal leader was present at the time of cremation although he died while performing his duty during the Kabaddi Cup organised by the state government of Akali Dal-BJP combine. Some villagers on the condition of anonymity said that they were shocked as no ruling Akali Dal leader had reached to condole the family at the time of cremation. A 25-member delegation of the National Bank for agriculture and Rural Development (NABARD) visited Guru Angad Dev Veterinary and Animal Sciences University. The delegation comprising top officials of the bank along with 15 district development managers of different districts of Punjab, witnessed different projects of the university. Delegation was led by Kishan Jindal, chief general manager, DC Sharma GM, and HS Bhatti GM. The contingent interacted with Dr VK. Teneja, Vice-Chancellor on different issues regarding livestock professions. Experts from both sides shortlisted the areas on which vet university and Nabard may work mutually. Each year Nabard organised one such meeting at a research institute with specialists of fields to express their views. Message of peace and unity given by Shubham and Vanshaj (pair from the age category 10-14 years) and group on the theme of Mumbai bomb blast through their dance performances touched choreographer Saroj Khan’s heart and left the audiences spellbound. She appreciated the efforts of participants and the organisers from creating an ambiance not less than any national reality shows. Audience was delighted to watch all dance forms and great talent under one roof. 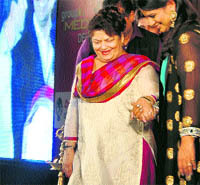 The finale started with a bang as Saroj khan entered along with dholi’s playing Punjabi beat depicting joy of Punjab after which lamp was lighted by Saroj Khan. Eight pairs out of which Narayani and Kartavya bagged the Best Seedling Pair (4-6 yrs)Nehal and Tanushri won the Best twinkiling buds pair (7-9 yrs), Shubham and Vanshaj bagged the Best Blooming Flower pair title and Aishwarya and Rajesh bagged the Best Fragrant Garland Pair title (15-20 yrs.). The prestigious title of dancer of the series went into the kitty of Harshneet Kaur (10-14 yrs age group)and won a gift hamper worth Rs11,000 . Union leader Jagseer Singh Sahota revealed that union members were fully prepared to distribute the material that exposed the anti-education policies of the Akali government. ETT teachers have been struggling for shifting in Education Department from Zila Parishad schools for the past five years. He also said that the government was discriminating against the college employees by not releasing the arrears of revised grades of the college employees, whereas the arrears of the employees of all other departments have already been released. The exhibition captures the design Falling Water at Bear Run, USA by Wright and Villa Savoye at Poissy, France by Le Corbusier. These have contrasting styles, Falling Water with varied material pallete setting amid the pristine nature and Villa Savoye in most controlled palette in an urban setting. About holding the photographic exhibition, he says that photography is part of work as architects. He visited these two buildings and captured different aspects of these architectural benchmarks. He visited the houses while pursuing his masters at Texas A&M University, focusing on the use of natural light in a built environment. People need to see and educate themselves about architecture and the way natural light can be used in creating strong architecture, he says. The light floating volumes of both the houses make a strong first impression. Falling Water appears to be resting, unsupported above the waterfool while Villa Savoye looks lika a large, horizontal rectangle set atop pilotis free from ground reinforcing Corbusier's ideas of simple forms, he says. "The strip windows in the house are not very large only two-and-a-half feet in height and are at eye-level, emphasising the use of glass " he said. He said that despite the changes, the work of master architects bears the hallmark of their genius. "You can tell who has designed a building just by looking at it," he says while talking about Villa Savoye by Corbusier. "His work is poetry in architecture and has a clinical effect on a visitor," he said. Falling Water is a great example of harmonising with nature. Only concrete, stone, glass and metal have been used to create the masterpiece, he said. DRV DAV Central Public School, Phillaur, has been organising the Sports Mania Week since November 16. During the week, inter-house matches in sports like badminton, cricket, basketball, and handball will be played. A march past followed the ceremony on the opening. An aerobic dance and group dance were performed. All the houses of the school were tagged by the names of international sports clubs as New Jersey Club, Yaralla Sport Club, Max Sports Club and Swiss Sports Club. Sports exhibition of overseas sports was held to encourage the students to participate in sports. Inter -branch athletic meet concluded today at Nankana Sahib Public School. Students from all the 11 branches competed with each other for the final trophy. Students showed great energy and dedication for each and every sport event. A colourful cultural programme was also presented by the students. Principal Harmeet Kaur Waraich welcomed all the dignitaries and read out school achievements in the field of sports. A 'Class Presentation Programme' was organised for the students of class III at Kundan Vidya Mandir in the school auditorium. The theme of the assembly was 'Guru'. The students presented songs, shalokas, group song based on this theme. The importance of a teacher in one's life was highlighted. The students also presented a character parade and highlighted the role played by great persons as Vivekanand, Lal Bahadur Shastri and Abdul Kalam in our lives. The students presented a dance that was highly appreciated. Prefectorial board comprising 90 members was elected and honoured during an investiture ceremony held at BCM, Dugri. Candidates were elected from four houses. Jagmeet Singh and Lovleen Kaur were named school captains. Discipline in-charge, cleanliness in-charge, sports in-charge and CCA in-charge were also elected. A baby show was organised at GGN Public School, Rose Garden, Ludhiana. More than 100 children participated in the event. Two groups were formed. ‘Baby Princess’, while Manvider Singh was named ‘Baby Prince’. Gurminder Kaur, principal of the college, was the chief guest. Speaking on the occasion the principal said that Kuka Moment was an important part of the Freedom Struggle of India. She said that the sacrifices made by the Kuka's in Malerkotla were an important part of history. “We must study this important part of freedom struggle. The history department organised a quiz contest on the Kuka Moment and Baba Ram Singh. As many as five teams participated in the competition. He immediately called the police and informed about the incident. Soon after a police team reached the spot and started the investigation. Giving details, the shop owner, Kartar Singh, said that he had closed the shop at about 9:30 pm. There was around 50,000 cash laying in the safe of the shop at the time when he left the shop. The thieves entered the shop from a window situated above the gate of the shop and decamped with the cash and two gold bangles of his sister which was kept in the shop for getting them redesigned from a gold smith. According to SHO Gurpreet Singh, the police has registered a case on the complaint of the shop owner and started the investigation. He further said that the police got some clues from the shop about the thieves and hoped that they would be arrested soon. The scant regard being paid to the sport can be gauged from the fact that the event management company is installing the light and sound system inside the circle where the kabaddi final is going to be played. Akshay Kumar, Chitrangada Singh and Deepika Padukone have confirmed their presence while John Abraham is also expected to be a part of the final. The district administration has decided to install 12 giant screens in various parts of the city to telecast live the world cup final. The giant screens would be installed in busy markets and shopping destinations so that residents can enjoy the star-studded affair. The decision of installing the giant screens was taken after it was learnt that more than 25,000 spectators are expected to throng the stadium. The police has also beefed up security in and around the Guru Nanak Stadium for the final scheduled to be held on November 20. Commissioner of Police Dr SS Chauhan said the stadium had been divided into different sections for effective policing. Traffic diversion would be implemented on November 20 on the road located near the stadium. Different entry points have been made for the public and the VIPs. Nearly 2,000 police personnel would man the stadium and the surrounding areas. The district administration has made arrangement for 45 temporary toilets for the convenience of the spectators.